We all have stories that don't necessarily come alive on our résumés. Sometimes these are stories of our families and childhoods -- the responsibilities that don't have a formal start and end date, or the accolades that don't earn us awards, however trophy-worthy they may be. These stories help paint important pictures of who we are, both personally and professionally. That in mind, my team launched the 2016 Jopwell Student Essay Grant in partnership with the 21st annual Black Solidarity Conference. Leading up to the conference -- which brought students from more than 50 schools across the country to Yale University's campus from February 11-14 -- we challenged the 750+ attendees to submit essays addressing some big questions: Where have you been? Where are you headed? What's missing from the conversation about Black America today? What will your legacy be? 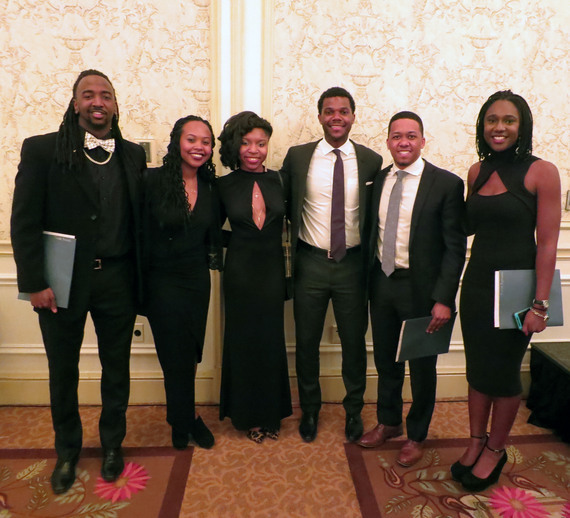 Now, on the heels of Black History Month, I'm thrilled to publicly celebrate the five student winners, whose full essays will be published in the coming months. A first-generation American with Ghanaian roots, Fletcher wrote about rifts within African-American culture itself as a key challenge, exploring fragmentation within the Black community in the United States: "Never having been in a situation where there were enough Blacks for divisions to form, I was caught off guard when I got to college. When we talk and read about being Black in America, absent from the conversation is the fact that we, as a people united by our complexion, are divided amongst ourselves." In a deeply personal account of her upbringing in Detroit, Myya advocates for mental health awareness to break the stigmatic cycles of society: "Cycles of mental illness and sexual abuse are often passed down generation to generation. My story is just one example of a three-generation cycle of bipolar disorder and sexual assault. I generally avoid these conversations, so imagine the millions of other untold stories out there. ... Let's break cycles, be advocates, create new statistics, and continue building legacies." Driven by the words of her doubters, Erika lays out her plan for delivering social change through technological innovation: "People of color and women have a voice that is not being heard at technology tables. I have made it my dream to change that -- not just for myself, but for the generations of minorities and girls to come," she writes, adding that by gaining the "skills necessary to dismantle technology's structures of exclusion and promote diverse future computer scientists, innovators, and informed citizens," we can save and improve lives. Disillusioned by modern-day racism but inspired by the bravery of his generational peers, Zac argues that ordinary people can become champions of extraordinary change: "Battles are won on the ground -- in the classroom, courtrooms, and boardrooms -- and that starts with ordinary citizens refusing to accept the status quo of white supremacy," he writes, going on to argue for "collective action and mass movements" as a means toward combatting deeply ingrained racial bias. Portraying an upbringing of exposure to rampant violence and a sense of aloneness, Tunde highlights education as an escape that may have ultimately saved his life. "Practically everybody I knew in Oakland had a family member that had been killed, or at least shot," he writes. "Everybody had been exposed to violence. Everybody thought that the way we lived was normal. ... When I tell people at Yale these stories, their reactions prove me wrong. I am not normal, I have been desensitized to violence, and I will never be like them." Porter Braswell is CEO and cofounder of the diversity recruitment startup Jopwell, which connects Black, Latino/Hispanic, and Native American professionals and students to recruiters at leading companies. He writes about recruiting, workforce diversity, and the startup grind.